Bits & Scraps Of My Life: Lasting Memories Layout Challenge Reveal!!!! Lasting Memories Layout Challenge Reveal!!!! I am tickled to death today to bring you my very first DT project for Lasting Memories!!! Pinch me, I'm still having a hard time believing I actually made the team!!!! This week's challenge is simply All About YOU!!!! This should be an easy one cuz no one knows you and well as you do :) This was kinda fun and we thought it would a great way to get to know they people that play along with out challenges and for you to get to know a little about us too!! 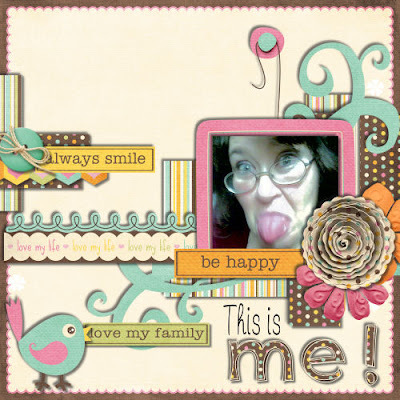 I went digi with my layout because I am out of printed photos of me......I used a super cute kit from Thaty Borges Designs called "I want to Be Happy"
So cute and so fun and yup........it makes me happy just to look at all the fun elements and color! Here's my take on the challenger and doncha just LOVEEE my glamour shot???? I have awful road rage!!! and I can;t stand feet.........I mean it!! I cringe when I see videos on TV where you get a shot of the feet.......grosses me out. I think this came about because one day Bob and I were at the park with the kids and this elderly lady came up and struck up a conversation with me. I will talk to ANYBODY!! And people always feel like they can tell me things that are best kept to themselves........it;s a curse. She felt the need to actually remove her shoes and show me that she had that toenail fungus thing.......OMG. She was sitting and stuck her foot up in my face to see it. Bob had to get up and leave because he was trying not to laugh. And she stayed there talking to me about her jacked up toenail funk for about 30 minutes. I can' look at feet or even go barefoot anymore.......thanks Toe jam lady!!!!!!!! I was a nerd in school.....SURPRISE!!!! Oh my! The story on toe fungus sounds like something that would happen to me! I am laughing so hard! I am secretely wishing for girls too when the grandchildren come along. Of course my curse would be that they are tomboys, after years of yearning to do pink, frilly, girly layouts! Love my boys, but there just comes a time, you know? WOOT! WOW-SO happy for you girl! Congratulations - you are so talented and will be an awesome addition to their team. That kit looks amazing and I love the layout you made with it.
. . . off to check out their site! just found your site and though I never post, felt I HAD to here. My son can't do the feet thing either. He will quit eating at the mention of feet or toes, never takes off his socks, will not go out in public with any one with flipflops, ect.... believe me it is bad. As a running joke I blame this (condition) on my (now deceased) sister who while he was a infant came every sunday morning for a visit. She would sit him in his carrier on the table and play with his "extreamities" and and say "monkey toes, monkey toes, aunt sue's monkey toes" lol. Anyway I have never known or heard of anyone eles having this issue. So nice to meet you. lol. This page just makes me giggle!!! I'm excited to join the DT and get to know you! I love how colorful your LO is! And sorry my DT page is my daughters FOOT!! I always find interest in what other people's cringe factors are :P I can't wait to see what else you come up with on the DT! Wonderful funny LO! I have the same foot thing and I'm a hairdresser but I could never be a pedicurist! Thanks for stopping by my blog and for your sweet comment. You make me laugh, and I need that SO much. What a blessing you have been to me today! I just became your follower, and hope you will come back on by to follow me - I need to keep checking in here cuz it lifts me up (and Lord knows it usually takes a tow lift to do that - LOL). Have a blessed day, my friend, and Hope to see you again soon. Wow! This was another FUN post to read! Night DJ?? I bet you were fantastic! People have always told my Hubby that he should have been a DJ. Has this raspy voice that is so low that when the kids ask to scream like a girl.. .he can't. LOL. I didn't know you had 5 boys... I was thinking 3... man... you must be so busy!!!!! So glad to you have on our team! We need someone to keep it real around here. Welcome!! OMGosh! I LAUGHED right out LOUD at your toe jam lady story!!! I can't stop laughing!! No wonder you don't like feet!!! Love your LO this week and the simplicity about it. Thanks for letting us "get to know you" a little!!! Awesome take on this week's challenge!! Love your glamorous layout pic and all your funny facts about you. Love your approach. Your house must be really busy with all those boys. Great job on the layout and on making us all laugh. Looking forward to creating with you at LM. This layout really shows who you are. Especially the pic!! Awesome idea.